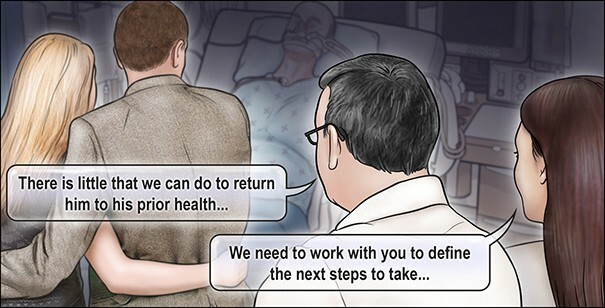 The final case of this critical care series looks at models of decision making surrounding end-of-life care and the fundamental principles of dying with dignity in the ICU. A 77-year-old man whose medical history includes treated hypertension and hypercholesterolemia, previous heavy alcohol intake, and mild cognitive impairment required 15 days of treatment in the ICU for septic shock due to faecal peritonitis from a perforated sigmoid colon. After being transferred to the surgical floor, he had an unwitnessed fall from his bed suffering an acute subdural haematoma with underlying hemorrhagic contusion, for which her underwent a craniotomy for evacuation of the haematoma. Twelve days after this procedure, during which he received no sedative medications, he remains in a coma with a best motor response of abnormal flexion on the left side. He is still receiving mechanical ventilation. The consensus opinion of treating clinicians is that he will most likely not make a functional recovery. How should further decisions regarding ongoing management be made? The majority of respondents (81%) voted to adopt a model of shared decision making with the family- electing to meet with the family to ascertaining the patient’s wishes regarding the continuation of active medical treatment and whether the likely outcome of continued treatment – at best, placement in a nursing home with a high level of care – would be consistent with his wishes. Most of the remaining respondents (13%) would have taken a more firm leadership roll in decision making – meeting with the family to tell them there is no hope of recovery and as such supportive care will be withdrawn. The editors note (here) that decision making models with regard to end-of-life care vary worldwide. This is reflected in the range of comments that have been posted by physicians worldwide: while some take a more active roll in leading a family towards a decision to withdraw care, others remain neutral and merely advise, accepting a family’s decision on behalf of the patient. The accompanying review article reports that “in one study involving surrogates of 169 critically ill patients, 56% preferred to receive a physician’s recommendation on the use of life support, 42% preferred not to receive such a recommendation”. The authors suggest that “asking families about their desire for recommendations from physicians can be a starting point for shared deliberations about care plan” and a good means of engendering trust. Where conflict arises between treating teams and families regarding the appropriateness of ongoing life-sustaining treatment, ethics consultations have been demonstrated to be helpful for staff and families and resulted in reduced hospital/ICU stay and reduced ventilated days, without changing overall mortality. The associated review article which covers the fundamental principles of holistic end-of-life care can be found here.